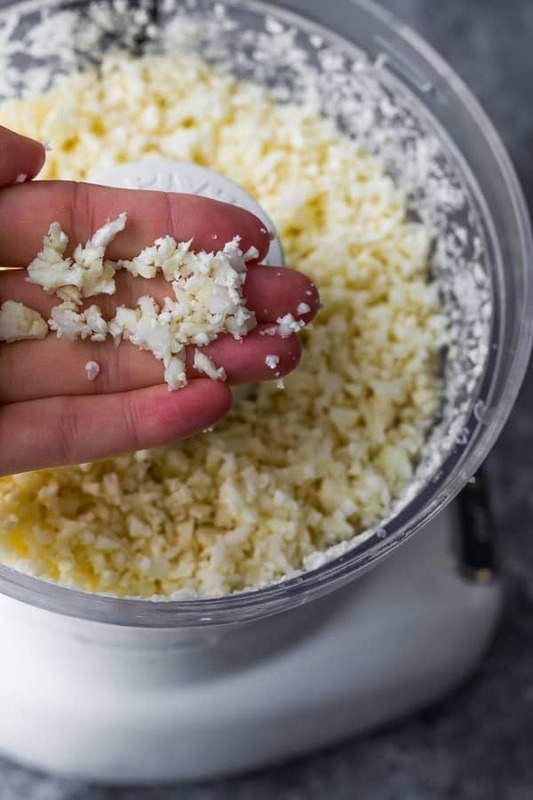 How to make cauliflower rice- an easy step by step guide with photos walking you through the (incredibly easy) process of making cauliflower rice. I’ve been sharing more and more ‘how to’ posts on the blog and I hope you’re loving them! I know sometimes some food can seem intimidating until you try making it for yourself. Take cauliflower rice, for example! I put this in the category of ‘too much work’ for a long time, until I finally got the courage to try making it. Is it too much work? Not at all! It takes 5 min to chop, a few seconds to process, and five minutes to cook. Total time is far less than you’ll spend cooking regular rice, and you are cutting out a ton of carbs and squeezing in a ton of veggies by doing so. I have experimented a lot with cauliflower rice and am sharing my findings below. AND! Stay tuned because I’m planning one of my seven flavor posts with cauliflower rice…because it’s fun to mix things up, right? 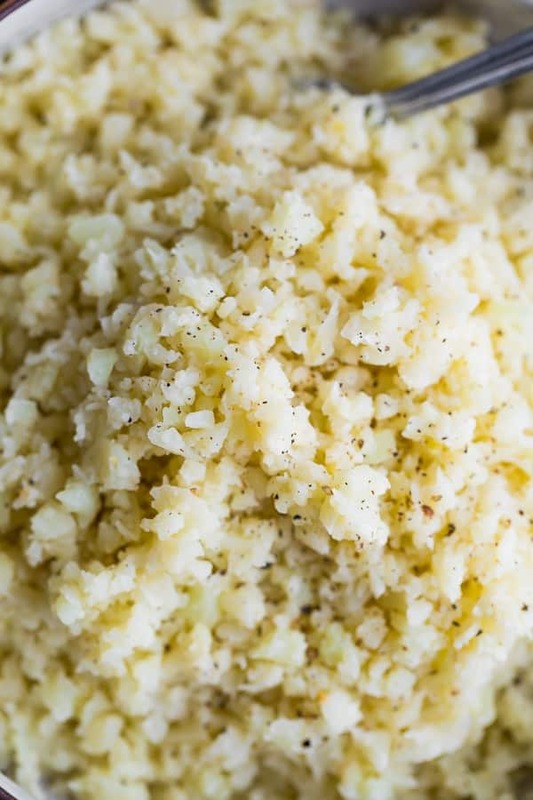 Want to add flavor to your cauliflower rice? 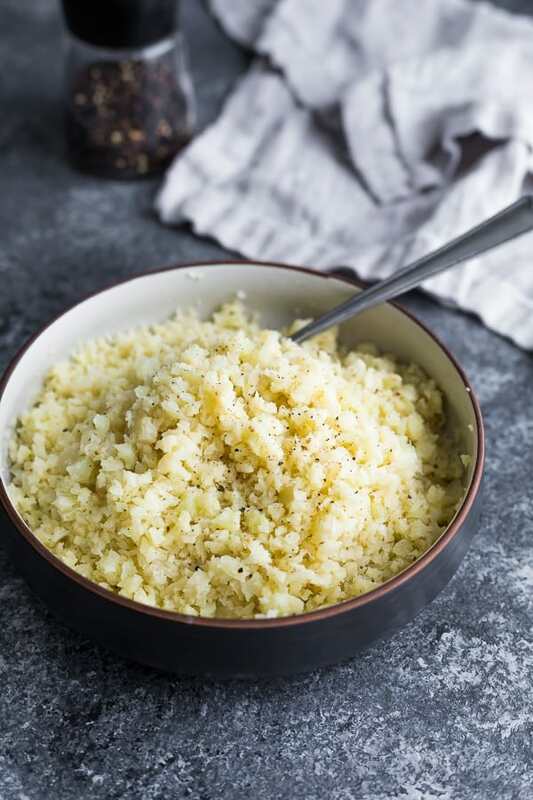 Check out these 7 Cauliflower Rice Recipes! Step One- Wash your head of cauliflower. Remove outer leaves. Break the head down into (somewhat) uniform florets. The more uniform, the better they will process. Include stems as well! Step Two, aka: how to rice cauliflower- place your cauliflower into a food processor fitted with a steel blade. You will likely need to work in 2-3 batches to rice a whole head of cauliflower. Make sure you don’t overfill the food processor; just fill up to the top line. Pulse until your cauliflower is in (somewhat) uniform small pieces. You can see in the photos above, after 10 pulses, there will still some larger pieces of cauliflower that will take a lot longer to cook than the other tiny pieces. By 15 pulses, they are much more uniform in size. Note- you can also rice cauliflower using a box grater! Here’s another shot of what my cauliflower rice looks like. So you can see there still are some large and some small, but it’s much more uniform than after 10 pulses. 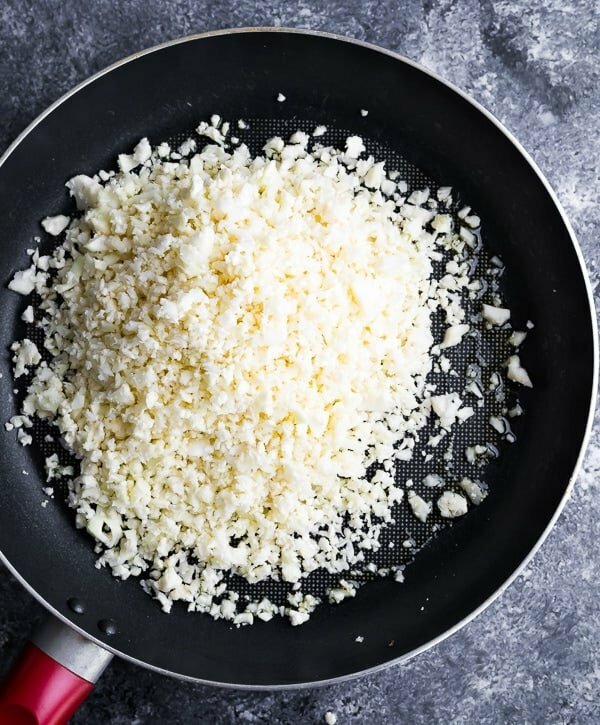 don’t over-process– this results in mushy cauliflower rice! Err on the side of a bit larger pieces. pick out any unprocessed florets- sometimes there will still be a few full florets left (I find this happens when I overfill the food processor). Pick them out if the rest of the cauliflower looks like the photos above. Step three- aka: how to cook cauliflower rice- I sautee with a little bit of olive oil, salt and pepper for around 5 minutes. You want it to still be a bit al dente and not mushy. That’s it! How easy was that?! Can I freeze cauliflower rice? 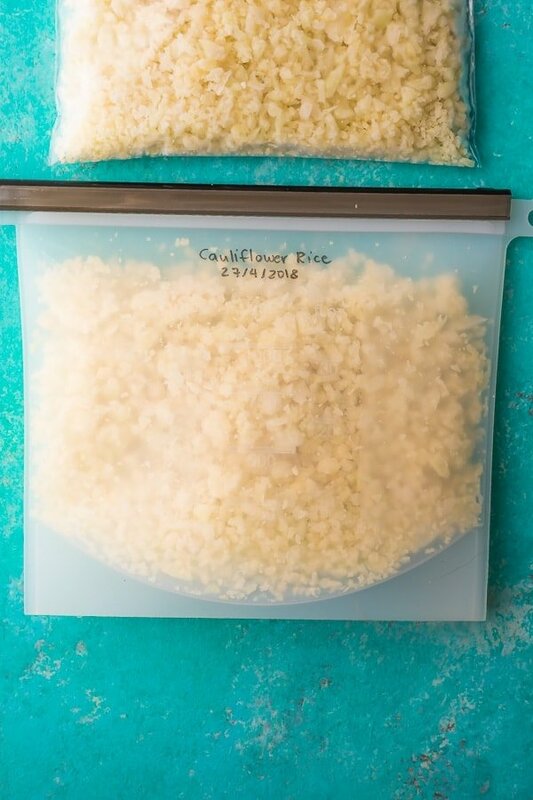 If you want to cook frozen cauliflower rice directly from the freezer, you may want to freeze it on a baking sheet first before transferring to freezer bags (to prevent clumping). 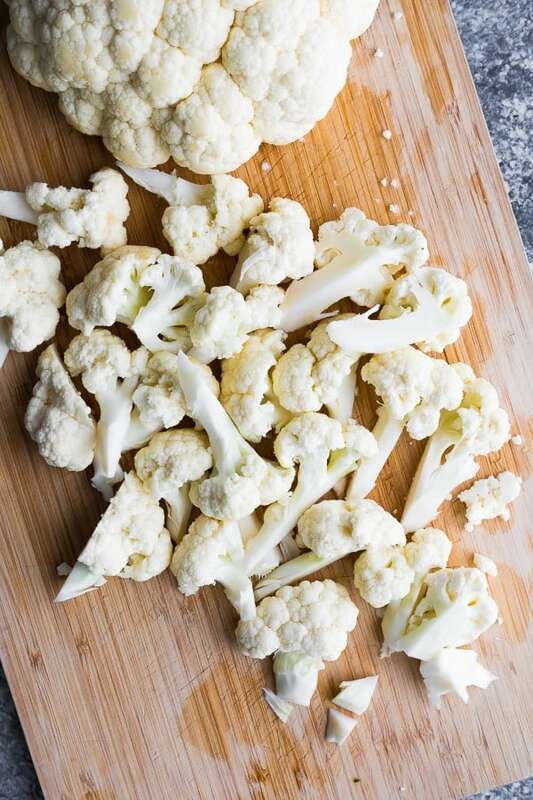 You can literally toss this frozen cauliflower straight into the pan to reheat…such an awesome dinner short cut! If you plan on thawing first, no need to freeze on a baking sheet. Portion it straight out into the freezer bags, then allow to frozen cauliflower rice thaw for a few hours before cooking. Do I need to squeeze out my cauliflower rice before cooking? I was curious to see if squeezing out the moisture from raw cauliflower (using cheesecloth) made a difference, so I tested it out. 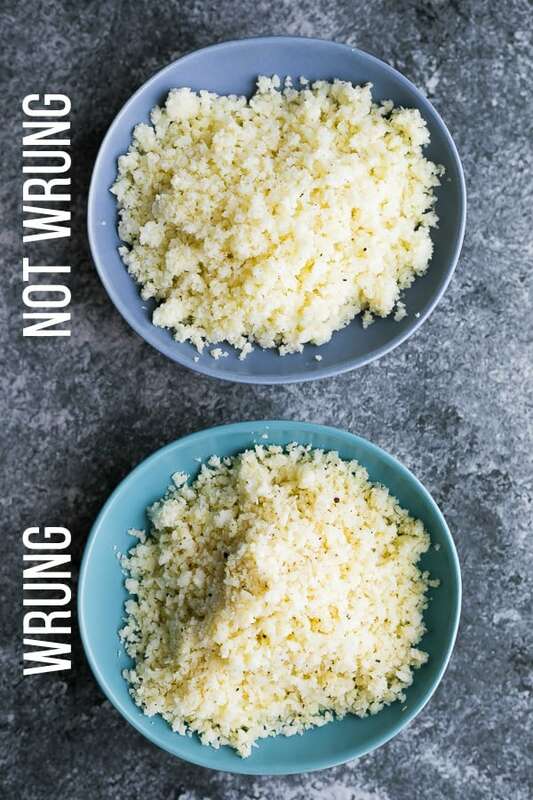 Pressing out the liquid before cooking did make a difference, as you can see the top (not wrung) cauliflower rice was clumpier and softer, while the bottom ‘wrung’ cauliflower rice had a nicer texture that was more similar to regular rice. The ‘wrung’ cauliflower rice also had more of a toasted ‘nutty’ flavor. However…I don’t like using up cheesecloth (can you wash and re-use it?) just to make cauliflower rice. It was more work and kind of messy, and I don’t believe the work was worth the difference in taste. So I will be skipping this step in the future! How long is cauliflower rice good in the fridge? I routinely use cauliflower rice in my meal prep recipes, which last in the fridge for up to 4 days. Does it smell amazing on day 4? Nope. But it tastes delicious and still packs all the nutritional benefits for you! Longer than 4 days, I’d be freezing it, personally. Cauliflower rice definitely doesn’t last as long as a whole head of cauliflower. How much cauliflower rice do you get from a head of cauliflower? Since cauliflower heads vary greatly in size, this is pretty hard to answer. One full food processor full of florets from half a head of cauliflower gives me 3.5 cups of riced cauliflower, so I’m estimating a full head will give 7 cups of riced cauliflower. Looking for more cauliflower rice recipes? Wash cauliflower and pat dry. Remove outer leaves; break down the head of cauliflower into uniform pieces (1-2 inch florets). Include stems! Working in 2-3 batches, place florets into a 7 cup food processor fitted with a steel blade. 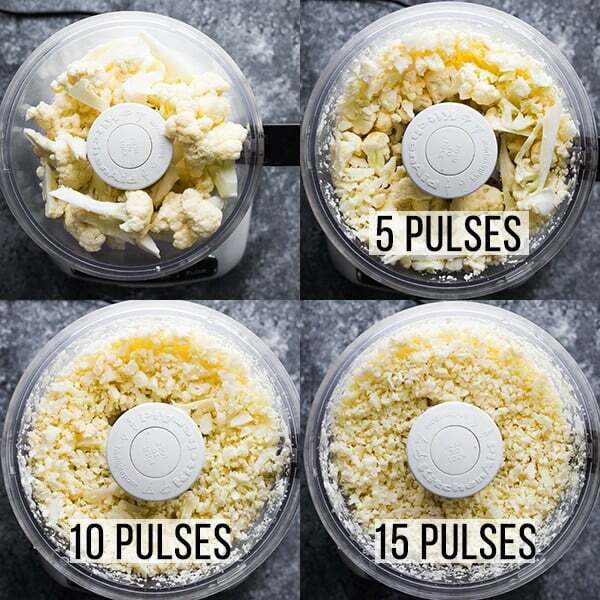 Pulse 10-15 times, until cauliflower is in small rice-sized pieces. Remove any full florets that may remain. Optional: for the best texture and flavor, squeeze moisture out of cauliflower using cheesecloth. Heat 1 tablespoon of olive oil in a non stick pan. Add the cauliflower rice and sprinkle with salt and pepper. Cook for around 5 minutes. 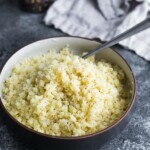 Cauliflower rice should still be 'al dente' with a bit of bite. Do not overcook as it will get mushy. Enjoy immediately, or store for later (4 days in the fridge or freeze for up to 3 months). Ah this is a game-changer! I’ve seen frozen cauliflower rice in stores, but haven’t bought it since it’s more expensive. But I love knowing you can prep it ahead of time and then freeze it yourself! Will definitely be doing this. I hope you find the tutorial helpful. Thanks, Brittany! FYI, you don’t need to waste cheesecloth to wring out your cauliflower (or shedded potatoes for hash browns, etc.). Just use a clean tea towel, flour sack towel, whatever. Then throw it in the laundry as usual. Easy-peasy! Great tip! I don’t have much experience using cheesecloth so this is good to hear! What perfect timing! Hope you enjoy, Pam!